EDITOR'S NOTE: We head to Atlanta (a.k.a. "Hotlanta") early tomorrow for the AIA convention and (very) early-morning keynotes and programs by some (very) notable folks, so we won't be posting again until Monday, May 18. • We are pleased to present the second in Salingaros's series Architecture's New Scientific Foundations: Architects often assume that complexity, in general, must be designed. That's a misconception, and rarely conducive to human wellbeing. • Cagle takes an in-depth - and totally fascinating - look at the tech world's new company towns, and why Mountain View said No to Google and Yes to LinkedIn (it has "Google fatigue"). • Jones has issues with "lefties" being "philistines about the past" with their "disdain for heritage. Is it because the architecture of the past is comforting that the left is so suspicious of it?" • A Harvard GSD panel looks at how architects and planners are attempting "to address connections between race, design and social inequity in poor neighborhoods," for a younger generation of architects who want "to combine excellence in design with social responsibility." • Meanwhile, though urban university campuses have sometimes "enhanced a sense of fear and bigotry," many are making "positive strides within their historically segregated neighborhoods" - by design. • How Washington, DC's 11th Street Bridge Park (a.k.a. the "High Line on the Anacostia") "intends to beat gentrification where others have failed" by creating "a model of inclusive development." • Lewis sees lots of TODs in our future, "driven in part by real estate market forces and changing demographics." • King cheers the happy ending to the long saga of Saitowitz's 8 Octavia that "looks even better in real life than on paper. The moral of the story - we don't need to settle for boilerplate buildings, especially when the forward-looking architecture understands the old-fashioned virtue of being a good neighbor as well." • Hall Kaplan cheers the happy ending to Killefer Flammang's 10-year saga of transforming a Long Beach church into affordable housing: "in the housing rank and file there are murmurs of hope that present the promise of rare paradigms." • Wainwright x 2: how Assemble landed on the art world's Turner Prize shortlist: "They don't claim to be artists, and none of them has even qualified as an architect, but that hasn't stopped this charming collective from building - and accidentally making the shortlist" (the group also designed the Lina Bo Bardi show at the Graham Foundation in Chicago). • He minces now words about the "bloated global extravaganza" that is the Milan Expo 2015, themed "Feeding the Planet" - a "bizarre architectural freak-show" where "visitors roam like herds of lobotomized oxen in search of nourishment." • Rawn, on a brighter note, offers "a closer look at World Expos' impact on architectural development" with a great historical round-up. • Eyefuls of Chipperfield's plans for the Royal Academy of Arts plans: "It's a small amount of architecture for a profound result." • Moore marvels at the newest member of de Botton's Living Architecture domiciles that is "a stonking shrine to a fictional woman" that shows "generosity of thought, wit and un-pomposity, sumptuousness" - and a fitting "requiem to FAT." • Lange and Miranda share musings on MoMA's "Latin America in Construction," and the "objects that caught our attention, the things we think may have been overlooked, and the ways in which we think this show is so important." • Storefront and the New Museum pick a winner in the 2015 Street Architecture Prize Competition, "selected due to its radical and innovative proposition that reframes architecture beyond form and financial structures beyond consumerism." • 2015 A+Awards include 5 Special Achievement Awards "in acknowledgment of their contributions to the field of architecture and design" (gala this Thursday!). 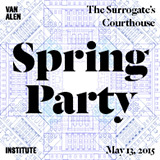 • A friendly reminder: "Get your digital paddles ready" for Van Alen Institute's "annual auction of out-of-the-box architectural experiences" - and Spring Gala tomorrow night! • Call for entries: 16th Annual AR Emerging Architecture Awards for excellence in completed work (international).